Flexible sensors have been developed for use in consumer electronics, robotics, health care, and space flight. Future possible applications could include the creation of 'electronic skin' and prosthetic limbs that allow wearers to 'feel' changes in their environments. One problem with current flexible sensors, however, is that they can be easily scratched and otherwise damaged, potentially destroying their functionality. Researchers in the Department of Chemical Engineering at the Technion - Israel Institute of Technology in Haifa (Israel), who were inspired by the healing properties in human skin, have developed materials that can be integrated into flexible devices to "heal" incidental scratches or damaging cuts that might compromise device functionality. The advancement, using a new kind of synthetic polymer (a polymer is a large molecule composed of many repeated smaller molecules) has self-healing properties that mimic human skin, which means that e-skin "wounds" can quickly "heal" themselves in remarkably short time – less than a day. 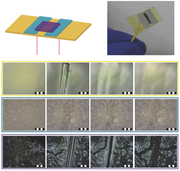 A paper outlining the characteristics and applications of the unique, self-healing sensor has been published in the current issue of Advanced Materials. "The vulnerability of flexible sensors used in real-world applications calls for the development of self-healing properties similar to how human skins heals," said self-healing sensor co-developer Prof. Hossam Haick. "Accordingly, we have developed a complete, self-healing device in the form of a bendable and stretchable chemiresistor where every part - no matter where the device is cut or scratched - is self-healing." The new sensor is comprised of a self-healing substrate, high conductivity electrodes, and molecularly modified gold nanoparticles. "The gold particles on top of the substrate and between the self-healing electrodes are able to "heal" cracks that could completely disconnect electrical connectivity," said Prof. Haick. Once healed, the polymer substrate of the self-healing sensor demonstrates sensitivity to volatile organic compounds (VOCs), with detection capability down to tens of parts per billion. It also demonstrates superior healability at the extreme temperatures of -20 degrees C to 40 degrees C. This property, said the researchers, can extend applications of the self-healing sensor to areas of the world with extreme climates. From sub-freezing cold to equatorial heat, the self-healing sensor is environment-stable. The healing polymer works quickest, said the researchers, when the temperature is between 0 degrees C and 10 degrees C, when moisture condenses and is then absorbed by the substrate. Condensation makes the substrate swell, allowing the polymer chains to begin to flow freely and, in effect, begin "healing." Once healed, the nonbiological, chemiresistor still has high sensitivity to touch, pressure and strain, which the researchers tested in demanding stretching and bending tests. Another unique feature is that the electrode resistance increases after healing and can survive 20 times or more cutting/healing cycles than prior to healing. Essentially, healing makes the self-healing sensor even stronger. The researchers noted in their paper that "the healing efficiency of this chemiresistor is so high that the sensor survived several cuttings at random positions." The researchers are currently experimenting with carbon-based self-healing composites and self-healing transistors. "The self-healing sensor raises expectations that flexible devices might someday be self-administered, which increases their reliability," explained co-developer Dr. Tan-Phat Huynh, also of the Technion, whose work focuses on the development of self-healing electronic skin. "One day, the self-healing sensor could serve as a platform for biosensors that monitor human health using electronic skin."